Abracada-What? 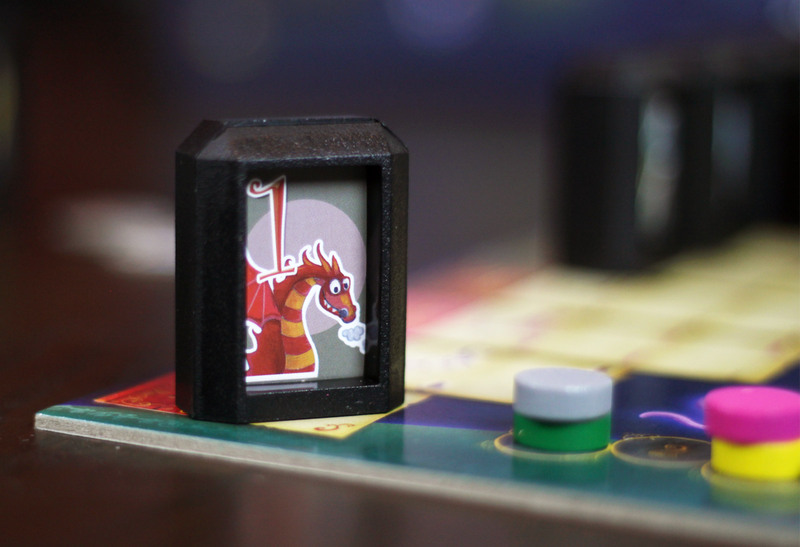 is a kid-friendly game of simple deduction. The goal is to cast all your spells at once, or to off all the other players. Well, that sort of escalated, didn’t it? This is, after all, supposed to be a kid-friendly game. Survival of the fittest wizard, I guess. Welcome to the arena of certain doom! Everyone has a set of spell stones, but no one can see their own. 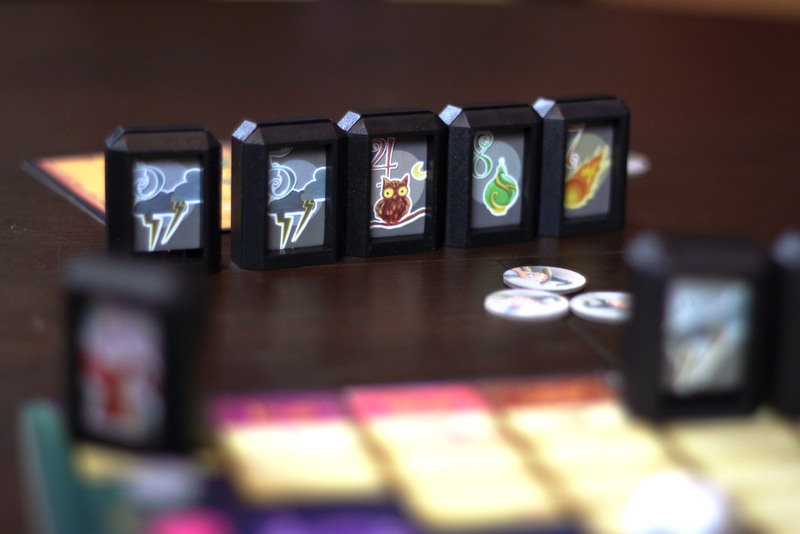 You can see the stones of the other players, as well as spell stones that have already been used up. 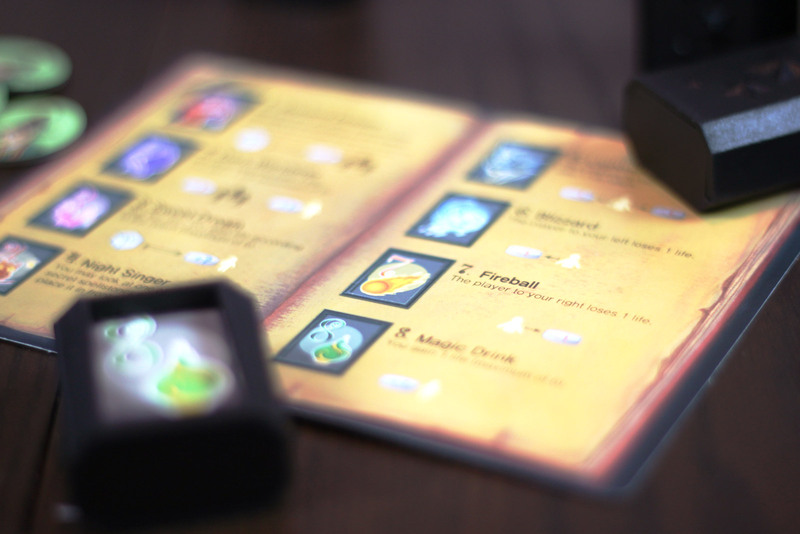 Players take turns attempting to cast as many of their spells as they can, by guessing one spell at a time. If a spell you guess is on one of your stones, another player removes it for you and you can keep guessing. But if you ever guess wrong, your turn is up, you draw more spell stones, and you lose a life point. Spells you successfully cast have a specific effect, such as damaging other players, healing yourself, or getting a peek at one of the four secret stones set aside at the start of the round. The catch with the guessing is that you can only guess a spell equal to or higher than any spell you’ve guessed on your turn; if you guess a 7 and are correct, you can’t then decide to go back down and try and 5 or a 4. The higher-numbered spells are more powerful, and there are more copies of them (8 copies of spell level 8, 7 copies of 7, etc.). 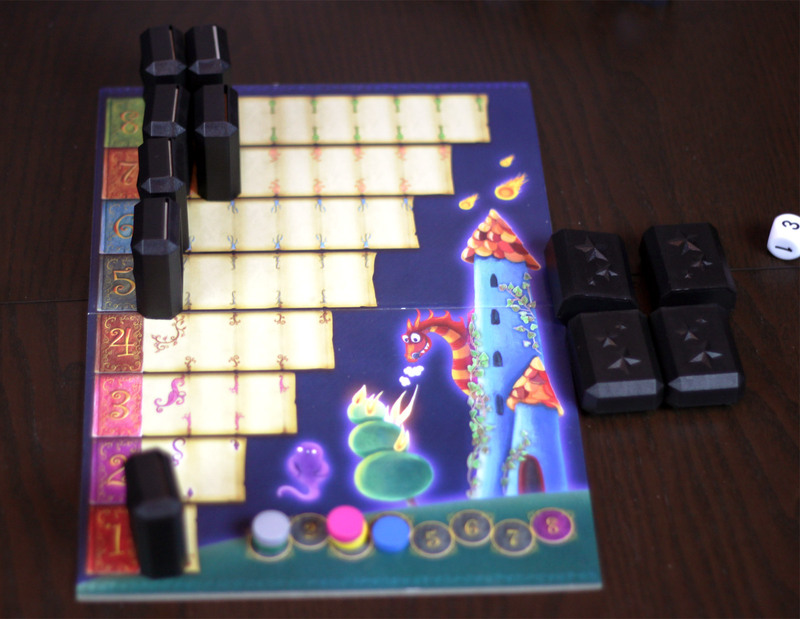 The round ends if a player casts all their spell stones in one turn, or if a player is killed off. Poor thing. Players score lots of points if they knock out another player, or get rid of all their spell stones. You score a few points for surviving, and a few bonus points for collecting Secret Stones. The game ends when someone reaches 8 points. Highest score wins! Which spells do I have? Only everyone else knows! You do have to take that into account, because for adults this game is a bit too simple, and grows stale very quickly. The guessing isn’t particularly engaging once you get used to it, there’s almost no strategy to be had, and some of the spells are clearly more useful than the others (and I’m not even talking about the mighty spell number 1, which at least is a big risk when you take the guess). But the game isn’t trying to be all things to all people, and so many of these things can easily be forgiven because of that. The Dragony dragon spell. Very deadly. For its target audience, Abracada-What? is a clever introduction to the deduction genre. 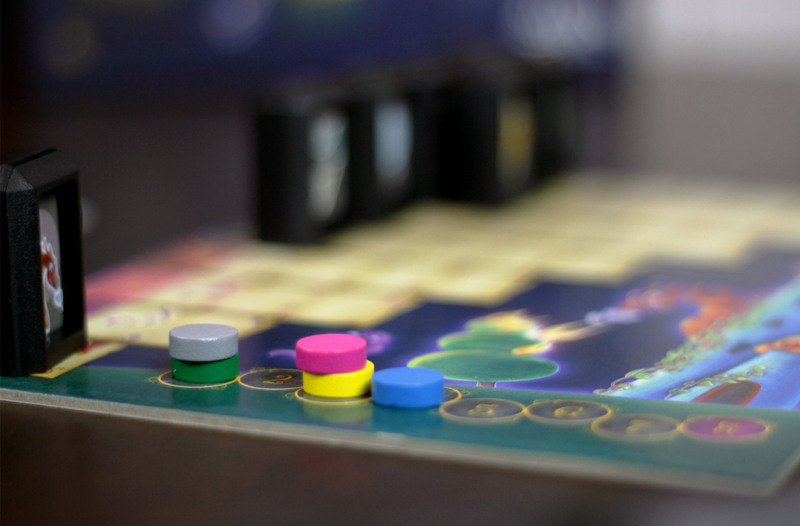 It’s colorful, the rules are simple, and interesting things (for kids) can happen while you play. And, there’s basically zero spite involved. What makes it work very well for younger players, is that all of the information really just out there. You don’t have to remember what’s been guessed, because everything that HAS been guessed is conveniently placed on a central board, with rows for each number. If you can count, you can count up how many empty spaces of each number there are, count up the numbers each other player has, and really narrow the guessing field for yourself. You never have perfect information, so it’s always a guess, but you can feel a whole lot like you’re figuring something out. For an 8-year-old kid, that gives you a lot of agency. There’s no long-term strategy to worry about (which is often the most difficult things for kids to figure out – even when they’re smart enough to make a good move in the moment, thinking long-term is a higher-level skill that most kids can’t grasp very well). This extremely helpful board helps kids keep track of what’s still out there. The most advanced skill involved is in trying to read your opponents by their own guesses. For example, if someone guesses a five, and you see two other players with fives, that might be a clue that you don’t have any. If someone doesn’t guess a number that you don’t see a lot of out on the table, you might be the one with a bunch in your hand. That’s really the only skill that will be particularly interesting to adults, but it doesn’t run extremely deep. I said there is no spite, even though some of the spells do damage. That’s because you don’t get to choose where you do damage; each spell targets someone specific. It’s either the player to your left, or the player to your right, or both, or everyone. Since you want to get rid of as many spells as you can, you’re going to guess the spells you think you have rather than try to hurt a specific player, so people can’t gang up on anyone and overwhelm them. (For adults, this feature might serve as a detriment – you may clearly see the person across the table starting to pull ahead, but you can’t really do anything to stop them other than just win yourself, which isn’t always under your control). 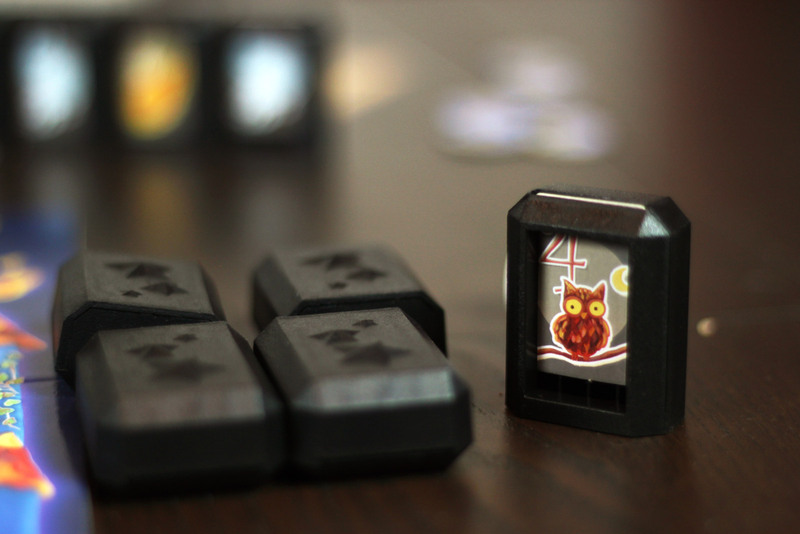 The other sort-of-spite related element – which is really more about hard feelings than spite – is that when one player does particularly well on a turn, it actually helps the other players. 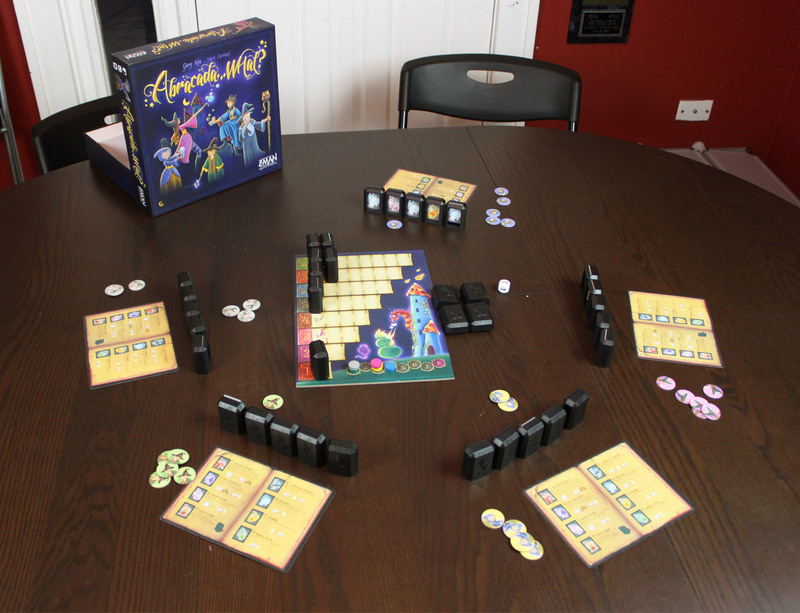 The guessing player clears several of his stones, adding them to the public board, and then refreshes his collection, which immediately adds new information for the other players. Sure, the guessing player has knocked off some guesses of his own by guessing correctly, but won’t be able to use that information until his next turn. That gives the other players a leg up, and a chance to catch up. That should give each player a healthy chance to win, and to at least stay in the game the whole time, without the heavy feeling of falling far behind and having no chance of catching up. The most imbalanced spell in this game is the Night Singer spell. It doesn’t do damage to anyone, but it does let the caster take one of four secret stones from the center of the table. These four stones are set aside at the beginning of each round, and the benefit of nabbing one is that you now have a piece of information that no one else has, and no one else can get access to. This is especially helpful later in the game, when there’s only one or two of each number left, and knowing that extra bit of info can make the difference in running your hand or… well, failing on your first guess. That’s all well and fine, but then each Secret Stone you’ve collected is worth points at the end of the round, assuming you survived. While the rest of the game isn’t exactly free of luck, you can still do well for yourself by guessing all your stones – which is mostly about deduction and making your best guess. There’s a little luck there, but it’s all in your hands. Night Singer, more like Night Zinger, amiright? Guys? Hello? Whether or not you get a level 4 spell, though, is completely out of your hands, and it lends a distinct advantage to you if you get it. Especially if you get more than one; in several games I played, I won handily thanks to getting 2 or 3 secret stones, which then allowed me better guesses to win rounds. If you score five points in one round, that really pushes you into the realm of victory quickly. I don’t see any reason why the level four spells give you points, especially as there are no other sideways methods of scoring points. But again, this is forgivable somewhat, since this game is targeted for younger players. They likely won’t see the imbalance this provides; and, hopefully, the level four spells will get spread pretty evenly. It does help keep the game moving along, and it leaves the possibility open for someone who has fallen behind to catch up. Ready to guess your spell stones? ARE YOU READY? So, what I’m saying is, this really is a good game for kids (we’re talking at least 7, probably 8 years old) to play, and an adult can certainly stomach it enough to have fun playing with them. 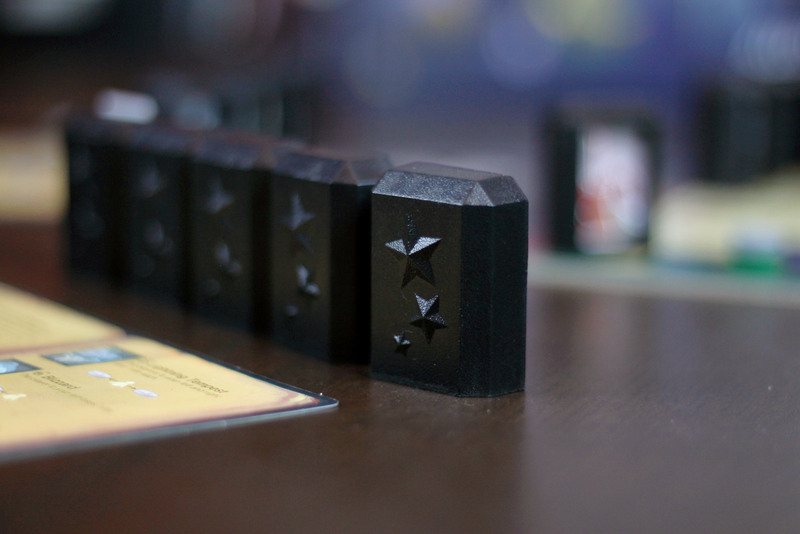 I don’t see this game getting a lot of plays with an older gaming group – if you’re into this sort of deduction, Hanabi is a much better and more engaging choice. For the kids, though, this is a step above Guess Who? that allows more players that will overall keep things pretty balanced. 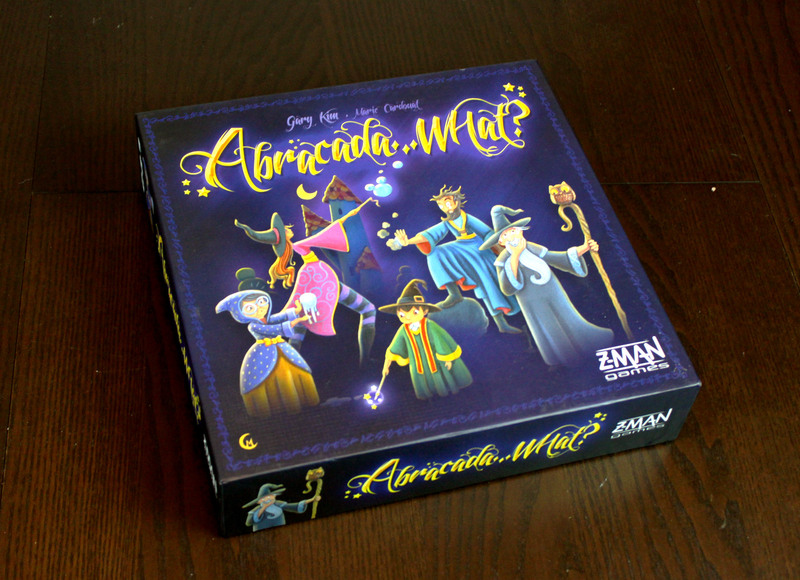 iSlaytheDragon would like to thank Z-Man Games for providing a review copy of Abracada… What? Next Article Pandemic Legacy is Coming!